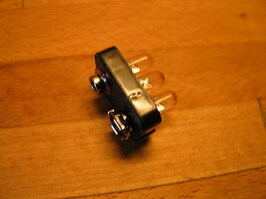 It’s the same thing every time, no lamp in place when you need one – so why not build a lot of these – always in place ! Start with localising the anode (+) and cathode (-) of the LED. Mark them up as I did (with a felt-pen), red for anode (the longer leg) and black for cathode (shorter leg and phased edge on the bottom of the plastic of the LED). I will in the following text write red and black. Then you need to open the old battery, as we will use the plastic part with contacts on the top. Donâ€™t forget to throw the rest in recycling for batteries. Now to the LED’s. Carefully bend the legs towards each other, hold between the plastic and bending point with a prier as you see in the picture. as LEDâ€™s don’t like high temperature. Beware of short circuits between the legs. Then cut off the rest of the legs outside of the soldering points. Check that you have one black side and one red side of the LEDâ€™s with the legs intact. Place the LED-packet in the plastic top, trim and adjust the black and red legs so they fit to the back of the contacts. The red connects to the contact which have openings, and the black to the round contact (opposite to the fresh battery) and solder carefully and quickly (the LEDâ€™s don’t like the heat and the plastic can melt). Adjust the LEDâ€™s so they point forward nicely, and check once more that no short circuits have appeared. Put just one contact together with the battery, and swing the LED-box over the other contact – and see – the three LEDâ€™s light up! Just swing back – and you have an integrated switch. The LEDâ€™s in this application will not light up fully, they need almost 4 Volt to do that and here they get only 3 Volt – but I think it’s enough, three LEDâ€™s give a lot of light. 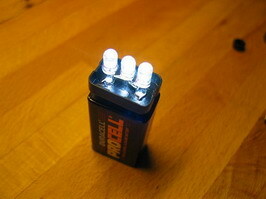 If you are brave (and rich) why not test with only two LEDâ€™s, they will not have a long life – but one hell of a light. What about the magnet? Yes, glue it up on the wall, and your lamp will stick on it – and you always know where the lamp is. But don’t do as I did – I put my lamp on the magnet before the glue was dry and so I had to pick it all up from the floor (but nothing broke – the construction is now tested in both function and strength). Great DIY! Far cheaper than buying a flashlight and batteries. Simple and functional. I might try it myself. We don’t have those same 9V batteries here in Canada, but I should be able to find a sutable 9V battery connector at the electonics store. You show a total ignorance of basic electronics. 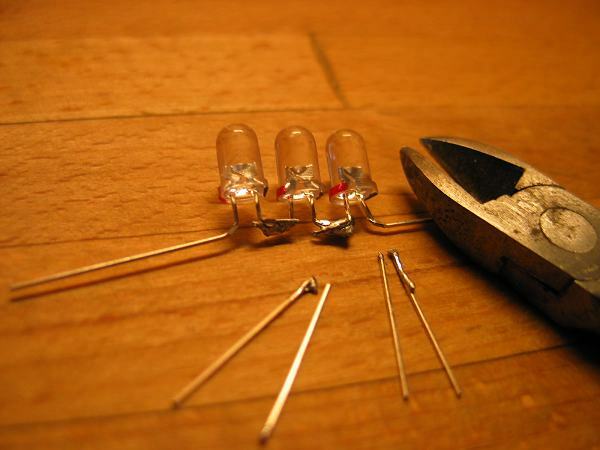 LEDs are not resistive devices like lightbulbs, they are semi-conductors. That 3.5V rating or whatever is not a measure of what you need to apply to light the LED, it’s a forward bias voltage drop. There is a very narrow voltage range where the LED switches from opened to closed circuit (in a theoratically ideal LED, this would be 0, in the real world there’s a small range). At best your circuit will have highly variable brightness, as the battery weakens a little, the LEDs will dim a lot and you’ll seem to have a dead battery when it’s mostly good. At worst, you’re destorying the LEDs. I think it is a great DIY. It isn’t an engeneering feat or anything of the like and has an obvious fault, but for the application it is a perfect solution. If I improved anything I would snip off one of the “tabs” of the connection with the “holes” (very technical) so that the connectors can slide smoothly over each other for a quick beam of light. Great job! electronics 101, instead of having a go the project why don’t you suggest a way of improving it. It would be more constructive and you’d look like less of a d**k.
Great project. If you connect the leds in parallel with a 150ohm resistor you get great light, longer led life, and extended battery life(3 days of constant on time). You an also cut part of the metal top off of the disgarded battery to use as a case for more complex projects that will work in the same manner. Sand the paint off for a cool metal look. Maybe you could fill the base of the LED holder with epoxy. That way there won’t be any shorts later on and it’ll be really sturdy. It appears to be a nice cup shape already. The parallel LED suggestion seems like a good modification too. what is the website where I can buy the 3 LEDs? pumps, project boxes, etc. Nice prices, too. what I am supposed to be buying? Are these the correct ones to buy? Have other people bought these and worked? Ethan, those look like they’ll work, but the price is obscene. You can usually get a 50 pack for under $10 shipped. Try ebay, I’ve ordered from the Chi-Wing Led shop there several times. You’re right, E101, Chi-Wing does have better prices on their LED’s, and 2x-3x the light output. But you can’t beat Sciplus for variety of merchandise and witty item descriptions. Thank you, but Chi- Wing does not carry this one. Can somebody give me an exact URL of where this item is located? Check #14 – more links ! â†‘â†‘â†‘ And this means what? Ethan, it means you are far to stupid to be allowed to play with batteries or solder – did you eat a lot of both when you were younger? Ethan (#15), if you are looking for cheap shipping we have low shipping rates and high quality LEDs. $3.00 shipping anywhere in North America (a bit more for the rest of the planet) for 100 or less LEDs. LED and 5.5V across the remaining wire. Since theoretical wire has zero resistance, infinite current will flow. battery. Also, the 3.5V is a “soft” number (hence, the “or so” earlier”), and some light will be emitted at a lower voltage. Ohm’s Law for further details on this. Any recommendations on where to obtain and how to insert a simple on/off switch to this project? Thanks. I use a similar configuration, only 2 LEDs in series wit a 100 ohm resistor (1/4 watt) and a 1N4148 diode. 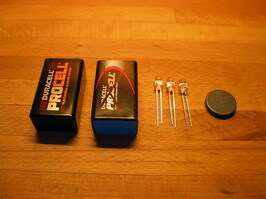 With a fresh 9V battery you have 20 milliamps that is the desired maximum current for the usual LEDs. And, vhen you dismount the dumped battery, pick too the plastic bottom, make two 5 mm holes with your solder iron and put this piece like a cover over your lamp with the upper part of the leds protruding out of the holes. Carefully you can fix well the leds and close all with epoxy or, in my case i had used hot glue (aiii it is hot!!!). If you desire is possible to fix on a side of the cover a little loop realised with iron wire, so you can connect your lamp to a lanyard (to me happens to drop the head of the lamp in the darkness, so better to have a lanyard). For the switch i use the #25 method, swing switch BUT fix well everything with the glue or the torsion can break the internal leads of your circuit. Sorry for my english but is not my mother language. the diode 1N4148 is required to protect the leds from an eventual reverse tension, 98% of the times is not necessary …. but Murphy…..
As Alberto posted it would be easier with 2LED’s glowing and a resistor in place. My intention was to use all battery energy to light (no burning of energy in a resistor)- But perhaps you can use that burning energy in the resistor as a ‘handwarmer’. Any idea how long the light output is usable? What about usable light versus a commercial light, or versus the modification of using the resistor with two led’s? Nifty project…but what’s up with the quick-tempers?! 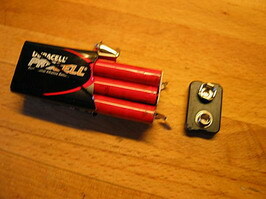 Does playing with 9v batteries give you some sort of rage issues? Be nice, people. store.. unless you want to ‘butcher something that is broken, but has 2, 3 or even 4 hi-output white LEDS in it. and putting them in series. that’s just me though. 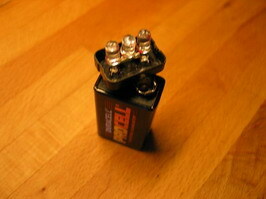 (plus, 3 AAs (even rechargables) will last far longer than a 9V. has come up with, is infantile and tactless. do us a favor.. Please use your knowledge and not your attitude. for the tail lights too..
Thanx for the motivation Chris! 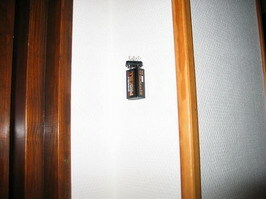 Chris J, your idea of using the top of an old 9v battery is very clever. Better,IMO, than using a 9v battery clip, with its’ attending wires. are still pretty cool. I got all the parts from various vendors on eBay. The epoxy idea is great, too. but I am too much of a novice to say for sure. I just built the PopSci LED candle today (mentioned above by Marvin, #34) and found this article while looking for modifications. Love the old battery top idea. The PopSci method requires no soldering, which is nice. Oh, and Marvin, I’m also a novice but Popular Science clearly did get the polarities wrong, as you said: they made the red lead of the battery snap (battery clip) negative, but I knew from Alan’s website that RED is positive. I also had to google to learn that the LONGER LED lead is usually the positive one. Sorry for the multiple post: this picture should help my fellow novices. Thanks for the feedback, Dave. I thought the polarities were backwards. with the right resistors, these LED candles will last virtually a lifetime. The wiki article was helpful also, Dave. Thanks. This was awsome! All kinds of great ideas and knowledge. I found a great place to get all your led’s and resistors for a really good price try digikey.com, you buy in bulk but way cheaper than ebay;) thanks everyone. hey please explain, how did you put the LED in the plastic socket? please email me at superinggofan@yahoo.com.ph please! I’ve been crazy about this for awhile and had to take it one step further. Kimmer, start with an old solar yard light that quit working. Take it apart and clean the contacts. Radio shack sells circuit/contact cleaner in a spray. I replaced the little LED with a 10mm led! Then I replaced the battery. Next, I sprayed silver/chrome paint on anything that looked like it was going to be reflecting the light that is emitted. I now have a solar charged light that is bright! It has lasted a year in the yard. One the occasions that power goes out, I have a 4″x4″x2″ block of wood with a hole drilled in it. The post from the light sits in it so I can use it indoors at night if I need to. I started collecting old solar yard lights from neighbors for free and rebuilding them. Then I give them back as gifts! Does anyone know where I can buy very inexpensive 5mm 365nm – 375nm UV Led’s, everyone seems to want lots of money.